Modern sedentary lifestyle and consumption of calorie-dense food are precipitating a rapid growing population of metabolic diseases such as obesity, type 2 diabetes and heart diseases. It is predicted, for the first time, that the current generation will have a shorter life-span than previous one. Understanding the molecular mechanisms underlying these metabolic diseases is urgently needed for us to prevent them or develop novel therapeutic strategies. Our studies are revealing a sophisticated RNA-regulatory network governing the development and function of major metabolic organs such as adipose and liver at various physiological and pathological conditions. We aim to determine the role of RNA regulatory network and how these RNA components crosstalk with the more well-understood protein network in the context of metabolic diseases. 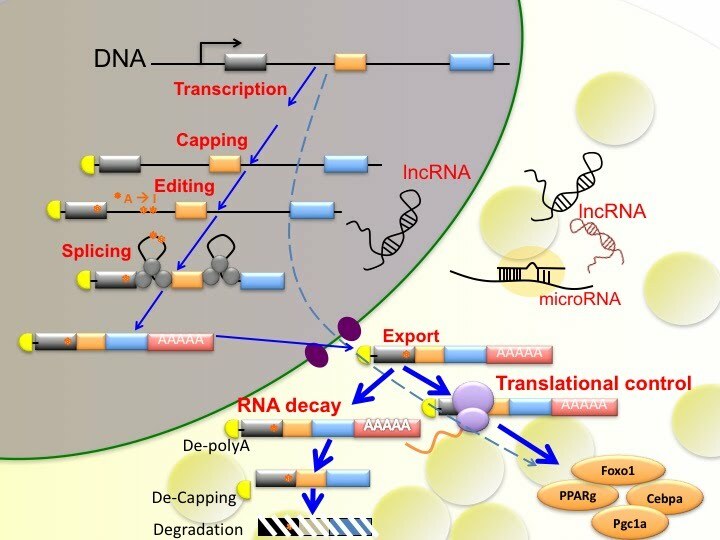 Our research topics encompass the regulation and function of non-coding RNAs such as microRNAs and lncRNAs, RNA processing such as splicing and editing, and RNA binding proteins. Postdoc Position available now (2018-April)! The laboratory is looking for a highly organised, motivated and hardworking individual. Requirements: Ph.D, Strong background in RNA molecular biology. Candidates should have a proven track record in the form of publications. Congratulations! Yen Ching's manuscript "De novo reconstruction of human adipose transcriptome reveals conserved lncRNAs as regulators of brown adipogenesis" has been accepted by Nature Communications! Congratulations! Alice's manuscript "Adipocyte long noncoding RNA transcriptome analysis of obese mice identified Lnc-leptin which regulates Leptin" has been accepted by Diabetes! Welcome! Tresha, and Qiuzhong are joining our group. Congratulations! Dan's manuscript "RNA binding protein, Ybx2, regulates RNA stability during cold-induced brown fat activation" has been accepted by Diabetes! Congratulations! Zhiqiang and Xiaoran's manuscript "Dynamic Transcriptome Changes during Adipose Tissue Energy Expenditure Reveal Critical roles for lncRNA Regulators" has been accepted by PLOS Biology! Welcome! Camille, Diana, and Wenning are joining our group. Congratulations! Dr. Lim Yen-Ching's manuscript "Dynamic DNA methylation landscape defines brown and white cell specificity during adipogenesis" has been accepted by Molecular Metabolism!